Well it looks like its been a week since we baked at the Kimball house in Pioneer Town. My friends Glenn, Susan and Scott helped with the work of it all. Here are some photos from the fateful day. We started by building a fire at 8a.m. 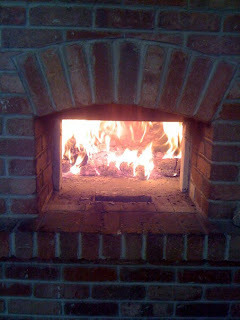 We had warmed the oven the night before, so we tried to get the blaze going as fast and hot as possible. Still, it seemed to take almost an hour before it was really crankin'. Then, once the fire was going we started mixing a 25 lb. 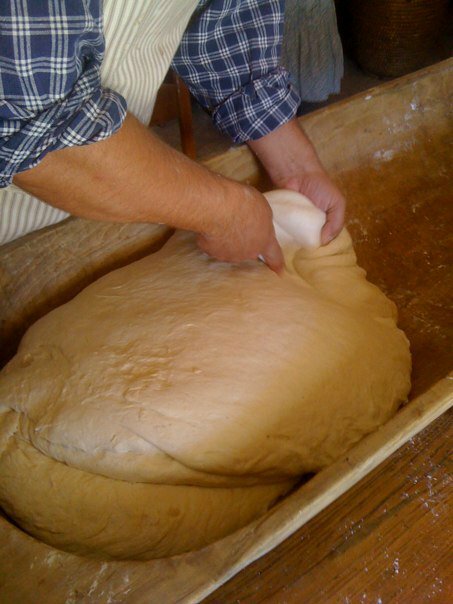 dough. This was the same basic dough I used when I made the big bake day previously, so I knew the proportions were alright. 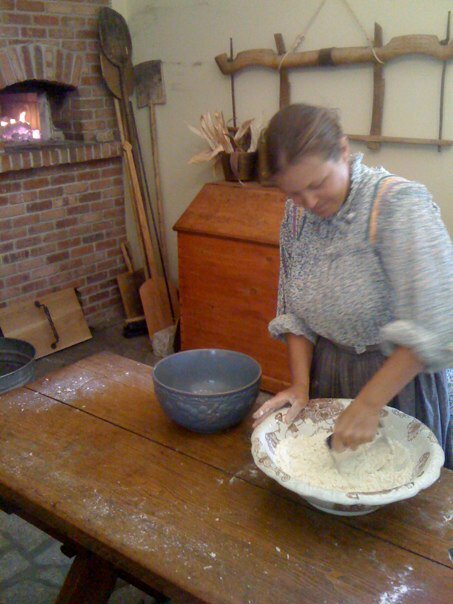 This is my friend Susan kneading. By 11a.m the fire had burned down considerably and the coals were doing well. The dough was rising nicely as well. 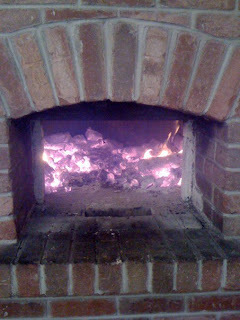 Around noon we scraped the coals out of the oven. Usually there is a mop of sorts to wash down the hearth so you don't leave a bunch of fine powdery ash to stick to the loaves. No mop here. The kitchen seems equipped for aesthetic purposes but not so much for functionality. Throughout the day I was wishing for all the things I had in my own kitchen, like assorted mixing bowls, knives, etc. Once the hearth was sort-of clean we threw some pizzas in. Yeah, pizza is not especially pioneer-authentic. But the hearth was hot, so whatcha gonna do with that high heat? These cooked in about 4-5 minutes each. Some who tasted them said it was the best pizza they'd ever had. 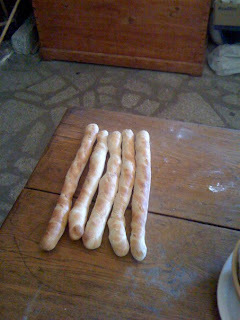 Also while the hearth was quite hot we baked a handful of small baguettes as a trial run. Not especially pretty. It was my first effort at using the baking peel and it took some learning. 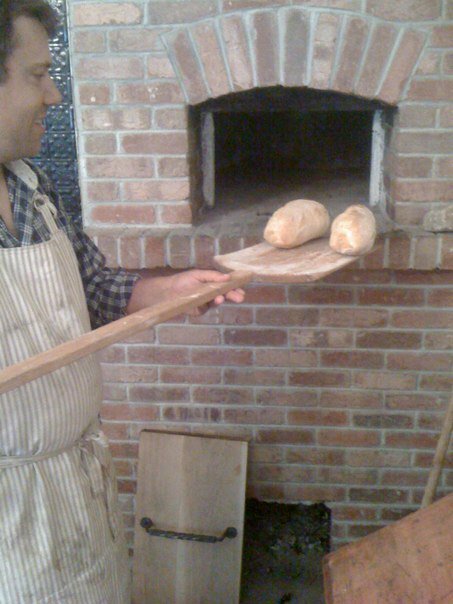 One of the baguettes landed on the hearth in a lump. We formed some loaves next. No good photos of the bread rising in all the little rising baskets I made. I bought a bunch of wicker baskets at D.I. and then sewed muslin liners for them. It worked out rather well, though the baskets seem to be sized for a rather small loaf, about 1 lb. 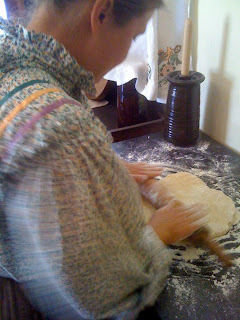 As the loaves were rising (or maybe earlier, can't remember, but the fire in the oven says it was earlier) Susan whipped up a pastry dough. She then rolled it out and laminated it with a pound of butter in layers. By this time the hearth was cooled enough for bread. Initially the hearth was so hot that when I cast a bit of flour on it, the flour scorched immediately upon hitting the oven floor. We waited fifteen minutes or so and it cooled down enough. The first loaves to go in baked in about fifteen or twenty minutes as compared to the usual forty at home. Of course they were smaller, but still, it was a piping hot oven. The last loaves to bake took considerably longer. The oven cooled off quite a bit. 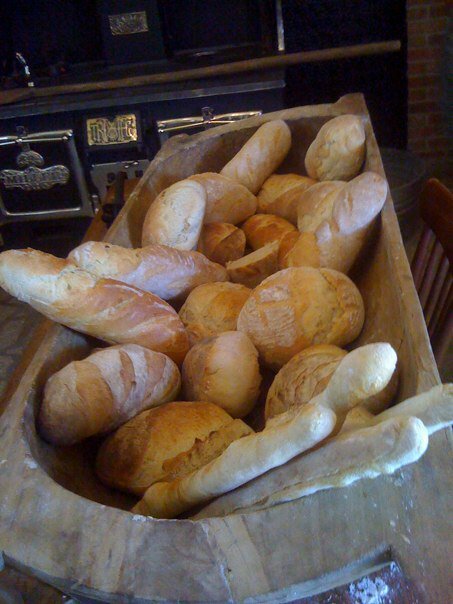 All in all we baked about two dozen loaves. Unfortunately, no photos of the pastries. My hand for pastry isn't particularly light, and the finished products weren't especially pretty. However, they were delicious. 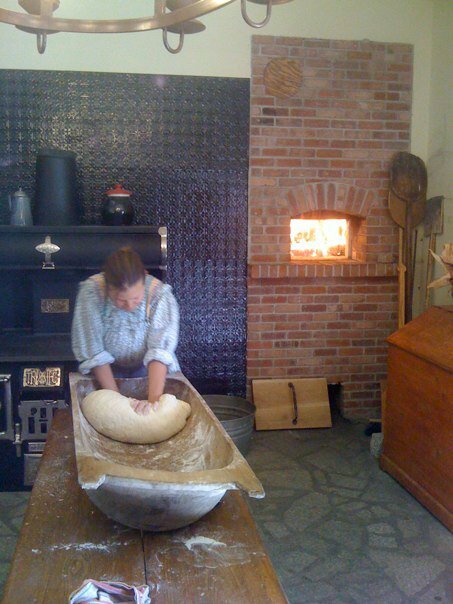 After we were done baking we loaded up the dough trough and walked around the town giving our bread away. The management team seemed to find it especially toothsome. By the time we went home, there were only a couple of loaves left for each of us. I'll figure a way to get those videos up - they're too large to email. oh how I wish we were neighbors...for more reasons than just the homemade bread.